So you want to get some backyard chickens. Or maybe add new chickens to an existing flock. You may be thinking of those cute, cuddly baby chicks you see each spring at the farm supply store. Or an exotic heritage breed you saw in a hatchery catalog. But have you considered adopting adult chickens? With a little investigation, you will find plenty of older birds that desperately need new homes. Adopting unwanted chickens from an animal shelter or an organization that rescues and re-homes factory farm hens can be a great option for building a backyard flock. And adoption saves lives. A flock of rescue chickens in Amana, Iowa, enjoying their first days in fresh air and sunlight. Compared to the typical happy backyard hen, hens used in commercial egg production have short and difficult lives. Factory farm hens generally begin laying eggs at 18-22 weeks of age and reach peak production around 30-32 weeks. Often by the time they are 16-18 months old, they are no longer considered economically viable and are sent for slaughter – never mind that a chicken’s natural life span is 8 to 10 years and that many backyard hens continue laying eggs well into their golden age. 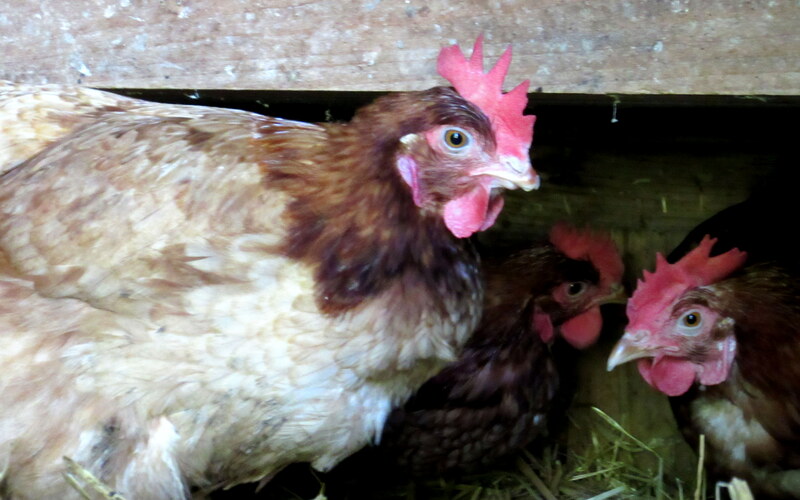 Fortunately, some of these “retired” chickens get a second chance at life. Several organizations exist to rescue chickens (and other animals) from the food industry. These organizations send the chickens to sanctuary farms and offer them for adoption. To find a sanctuary near you, visit Animal Places Sanctuaries. Note that many rescue organizations promote veganism and will place chickens only with people who will not eat the eggs. Some organizations use Deslorelin, a contraceptive implant, to suppress egg-laying in hens. If you would like to enjoy the benefit of fresh eggs from your hens, avoid these organizations. 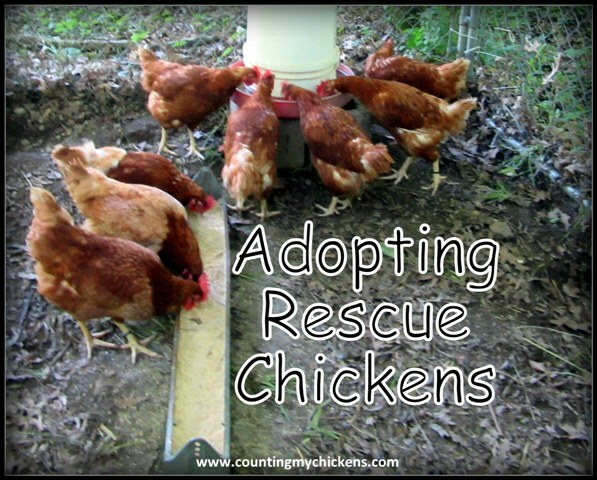 Other options for adopting rescue chickens include traditional animal shelters, which often end up with abandoned backyard chickens, the classified ads, or farm sales. Rescue chickens exploring their new home. Adult chickens won’t require special equipment like an incubator or a brooder box. While it may take your rescue hens some time before they start producing eggs (remember, their poor, spent bodies probably need a break), you likely will get eggs much sooner than you would waiting for baby chicks to mature. If you live in the city or suburbs, zoning ordinances may prohibit roosters, or you simply may not want to have a rooster crowing in your backyard. But sexing baby chicks is an inexact science. Even if you purchase what you believe to be female chicks, you may end up with one or more males. With adult rescue chickens, you know exactly what you are getting and won’t have to dispose of an unwanted roo. 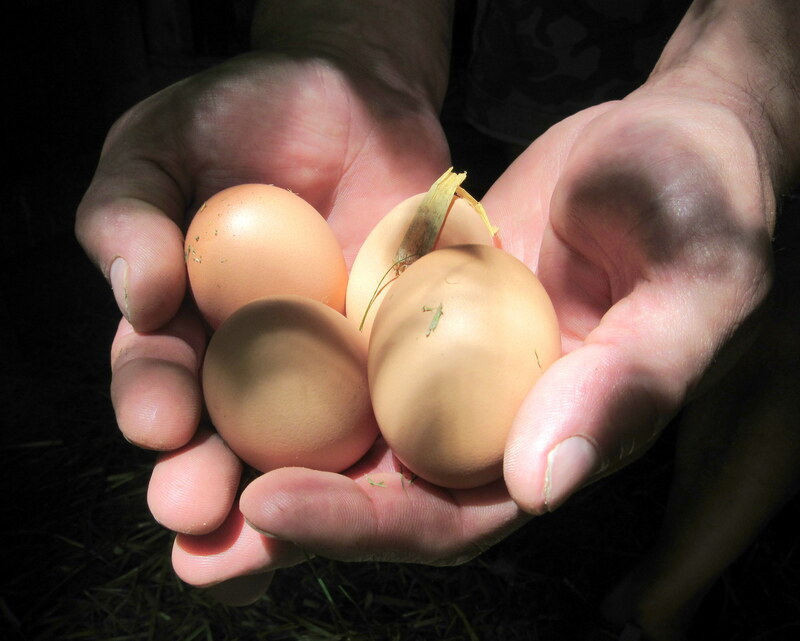 One benefit of adopting adult hens: Eggs! So you’ve decided to adopt some rescue chickens. Good for you! But understand that you may face some challenges. Chickens that come from a factory farm may show up in poor condition. Up to now, they’ve had a pretty rough life. They most likely lived in close quarters without access to sunlight and fresh air. They probably were restricted in their ability to engage in natural chicken behaviors like scratching and pecking or dust bathing. Their beaks may have been trimmed, making it more difficult for them to pick up food. They may be missing feathers from pecking by other hens, malnutrition, or stress. They may have respiratory illnesses due to their close confinement. And forget cuddling with your new pets. They most likely have had limited interaction with humans up to now and will be very wary of you. Rescue chickens with trimmed beaks. Amana, Iowa, homesteader and Counting My Chickens reader Steve K. recently obtained 15 hens from the estate a small egg producer. The farmer had died several months earlier, leaving 350 pullets in a barn, and someone else had been caring for the birds while the estate was being settled. Steve explained some of the challenges he faced with his new backyard flock. While the chickens seemed to be well-fed, it appeared they had been living in a lot of poop and mud without much room to move around. They had hard clumps of dirt encrusted on their feet and matted into their feathers. Some birds had such dirty feet that they had difficulty walking up the ramp into their new coop. It took Steve a lot of effort to get their feet clean. A rescue chicken before cleaning. Additionally, all but two of the 15 birds had trimmed beaks. (Beak trimming is used in commercial egg production to minimize pecking injuries.) Steve would have to monitor the flock to make sure the two hens with intact beaks weren’t overly aggressive towards any of the others. He also would have to make sure the trimmed birds were eating and grooming themselves sufficiently despite their blunted beaks. A trimmed beak compared to an intact beak. But of greater concern to Steve than the hens’ physical condition was their behavior.. The first thing he noticed was that they didn’t vocalize like normal chickens. Instead of hearing cooing and clucking and all of the other normal chicken sounds, Steve heard silence as he drove the hens to their new home. 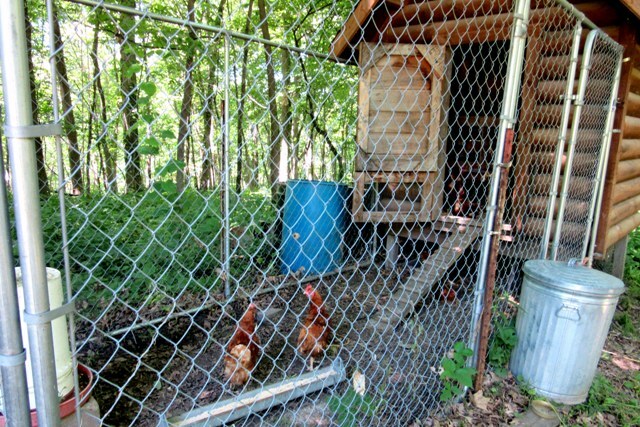 When he got them home, the chickens didn’t know how to react to their new living arrangements, a spacious pen and coop. 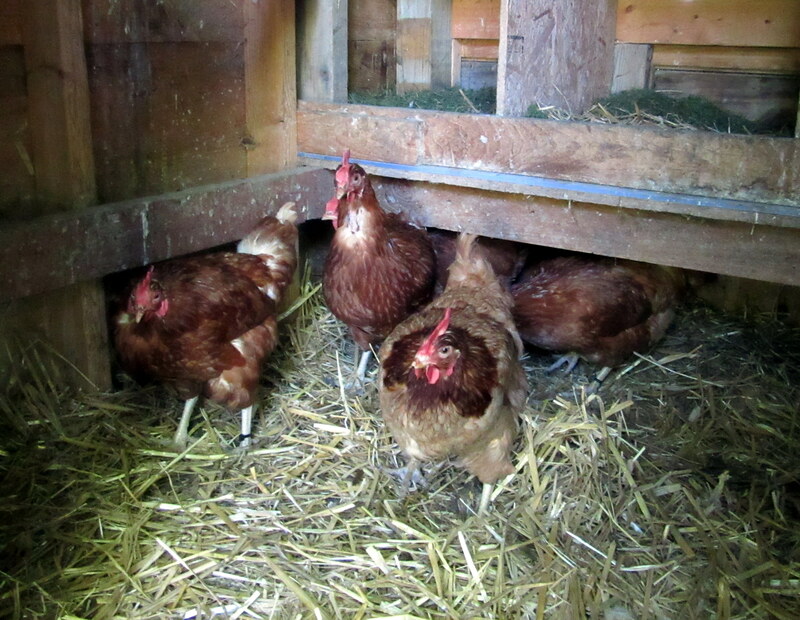 The hens’ confusion continued when it came time to go inside the coop and roost. For the first several days, Steve had to manually place the chickens on the roost at night and take them down the next morning. They didn’t seem to know about nesting boxes, either. They laid eggs while perched on the roost, letting the eggs fall to the floor and break. Fortunately, the chickens adapted quickly to their new environment. To win over his new flock, Steve said he was generous with treats like grass clippings, melon rinds, and carrot peels – things they most certainly never experienced at their old home. And now he hears happy chicken noises when he comes around. Rescue chickens in their new home. If you have an existing flock, the first thing you should do is quarantine the rescue chickens in a separate, distant area for a period of no less than 30 days. 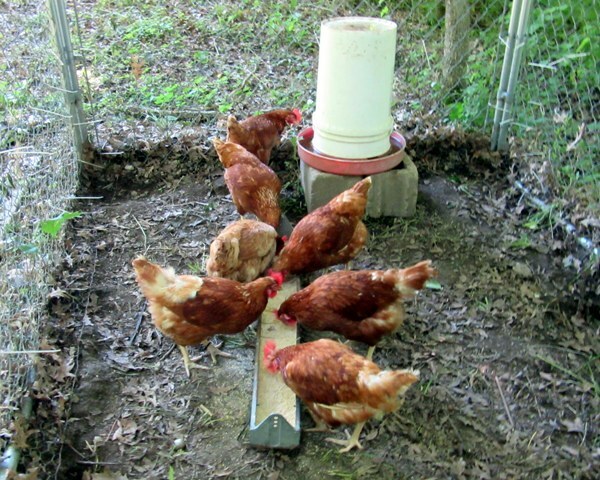 Give them separate feeders and waterers and practice good biosecurity to avoid exposing your existing flock to anything the new chickens might be carrying in. During the quarantine period, observe the birds closely for any signs of illness or parasites and treat accordingly. When introducing the new birds to the existing flock, do so slowly to give the new pecking order time to sort itself out. 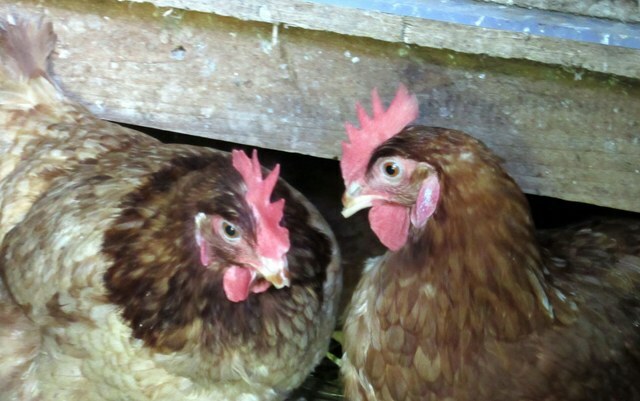 For more information about introducing new chickens to an existing flock, check out this article from Backyard Chickens. 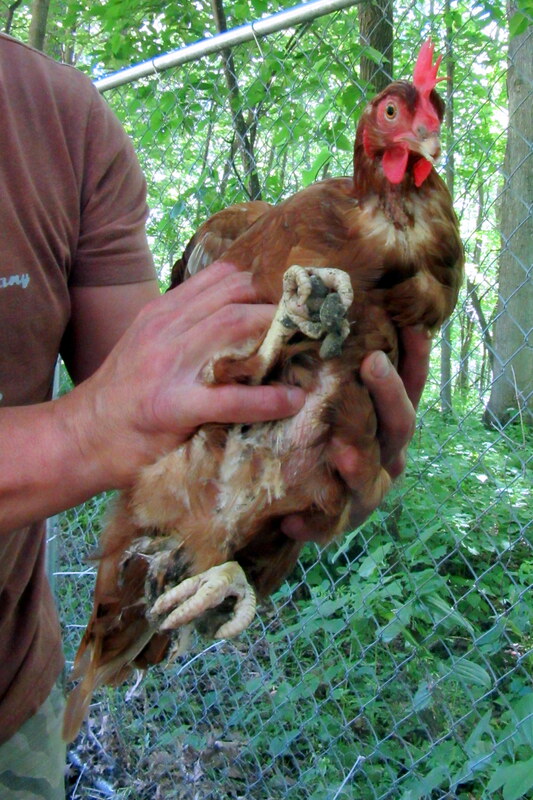 If the rescue chickens appear malnourished or are missing feathers, offer high-protein feed. Also consider providing vitamin supplements in their water. If the chickens have trimmed beaks, remember that they will have difficulty picking up food off the ground or from a flat surface. Providing a deep feed dish will help them eat. Also provide an area for dust bathing. All chickens should have a dust bath, but dust bathing is especially important for chickens with trimmed beaks. Blunted beaks make grooming more difficult and make the birds more susceptible to external parasites like mites and lice. A dust bath helps them stay clean and parasite-free. Finally, go slowly and give the birds a chance to adjust to you and their new surroundings. With a little patience and time, you should soon see your rescue chickens transform into delightful backyard pets. This entry was posted in Raising Chickens and tagged adopting chickens, backyard chickens, chicken care, rescue chickens by Deborah Neyens. Bookmark the permalink.